Asia is a continent full of beautiful countries, one more exotic than the other, and all make great vacation destinations. But you will like these cheap Seoul flights even if you are going on a business trip, not on holiday. Book one of these on sale fares now and travel to the South Korean capital from major North American cities for less through the Fall of 2015. 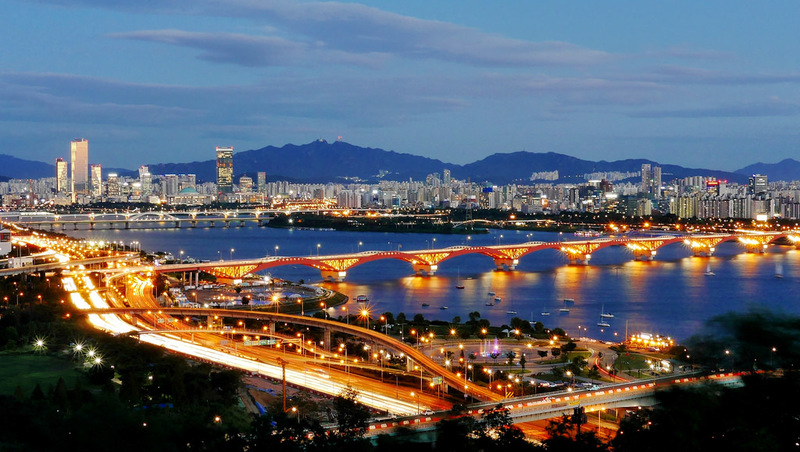 Before you check the Seoul flights we have found, you should take a look at the other flight deals we have found to major cities in Asia and you might choose another destination for your trip. 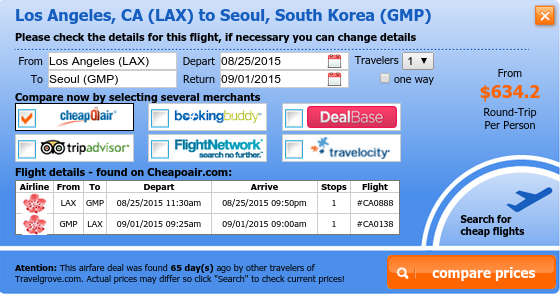 The cheapest flight to Seoul we have found departs from Los Angeles. It is a China Air airfare that leaves Los Angeles International Airport (LAX) on August 25 in the evening and returns on the morning of September 1 from Gimpo International Airport (GMP). The second best offer is a flight from Vancouver, Canada and costs $679 r/t. Book this offer and depart from Vancouver International Airport (YVR) on October 13 and fly back from Gimpo International Airport on October 21. The flight has one stop each way. The Honolulu to Seoul airfare we have found is $687 round-trip, operated by United Airlines. You would take off on September 29 from Honolulu International Airport (HNL) and will fly back from Incheon International Airport (ICN) on October 6 2015. 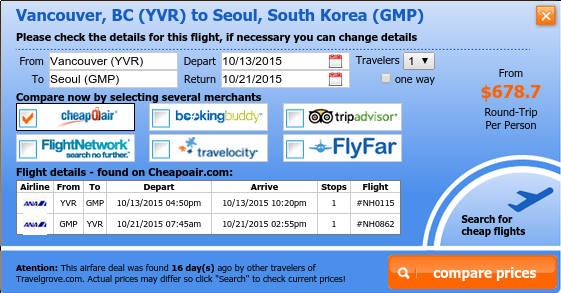 You can also travel cheap to Seoul from Victoria, BC, Canada. The multiple airlines operated flight we have found is $712 r/t and starts out of Victoria International Airport (YYJ) on October 13 2015. The flight returns on October 21 from Gimpo International Airport (GMP). This flight has got two stops both ways. 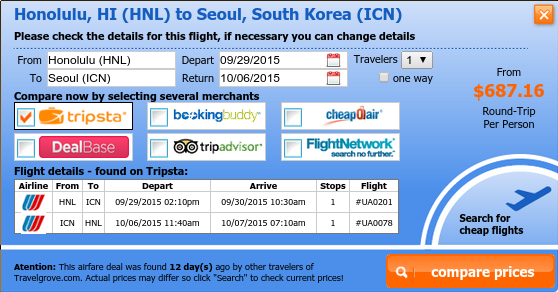 Thanks to our deal hunters, you can fly to the South Koreal capital under $800 even from Chicago. The multiple airlines flight we have found flies out of O’Hare International Airport (ORD) on September 30. 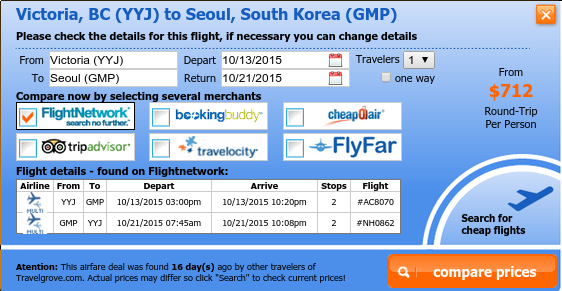 This deal is great for a longer vacation as the return flight is on November 7 from Incheon Intl. Airport. The Portland to Seoul flight we have found is $821 r/t and is operated by China Air. It departs from POrtland International Airport (PDX) on September 15 and fly back from Incheon Airport on September 21 2015. You can also search for cheap flights to Seoul – or any other city – in the box below. All you have to do is enter your travel details, select some sites and compare their prices to find the lowest fares. This entry was posted on Friday, September 9th, 2011 at 6:07 am	and is filed under Airfare Deals. You can follow any responses to this entry through the RSS 2.0 feed. You can leave a response, or trackback from your own site.